Sarasota Ford’s Owner and Operating Partner, Matt Buchanan, is one of our co-founders, and often tries our solutions before they launch to our members nationwide. So when Facebook rolled out their advertising platform in 2012, we knew something BIG was coming…and our teams jumped right in to see if auto dealers could sell more cars using Facebook. When DU’s team of Facebook Nerds dove further into Facebook’s data, we realized we could do a hell of a lot more. We could unlock all of Facebook’s other data (like behavioral data, psychographics, demographics, and third-party data), and THEN layer in automotive data to narrow our audience and advertise smarter. Since Sarasota Ford hosts over 1,000 events for initiatives like the American Cancer Society and the annual Sarasota Grand Prix, they’re a hard store to beat when it comes to local involvement. With a brand message so strong, why were we only trying to connect with people through their vehicles? Through our program, we knew we could help Sarasota Ford target In-Market Auto Shoppers who cared about the same causes, events, and specials the dealership was already promoting. Like all digital advertising, it was nearly impossible to prove our Facebook campaigns were the source of those incredible results and their increase in floor traffic. Initially, the best way we could track a campaign’s success was via the Facebook Pixel, a code placed on the dealership’s website. But that could only go so far as tracking website clicks and conversions that happen online—it didn’t track any purchases OFFLINE. Before we could insist for more dealerships to allocate a brand new ad spend, budget, and strategy to Facebook…we needed more proof. And in June 2016, we finally got it. The key to measuring Facebook ad ROI once and for all arrived in a new tool called Offline Conversions. 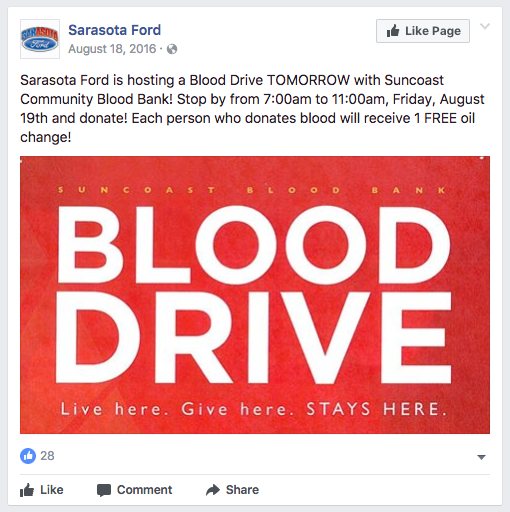 By uploading Sarasota Ford’s sales report against Facebook’s database, we were finally able to track exactly how many people who just purchased a vehicle from Sarasota Ford ALSO saw their ad campaign. When we uploaded their report, we were blown away. …and that’s when we turned Facebook’s head. What’s more powerful than delivering the right message to the right people at the right time? Every Wednesday, Sarasota Ford runs a promotion where they offer a free car wash, oil change, tire rotation and free massage for women. To get that message out, our Facebook team ran a video ad in November promoting the exclusive offer and discounts to women on Facebook who were In-Market Auto Shoppers or Vehicle Owners near the dealership. In just 5 days, their campaign had over 16,000 views. PRO TIP: Not seeing dealership Facebook results like this? Try video! Users are watching and uploading videos to Facebook more than ever before. According to Mark Zuckerberg, the social network’s users view more than four billion videos a day. The key to the campaign? Not wasting money on reaching people who can’t take advantage of the offer in the ad. Being able to show the right offer to the right people isn’t a crazy concept. But it’s something that a lot of auto dealers—hell, a lot of advertisers—still aren’t doing. Dealers who are mastering the true power of Facebook Advertising and are being featured as auto dealer success stories are running campaigns that actually connect with their audience. …or even running hire ads for service techs to people with past experience in that field. The options are endless. The results are beyond doubt. And Facebook’s next auto dealer Success Story could be yours—but you have to be willing to go the extra mile and uncover what all of Facebook’s data can do. Here’s how we “DU” it.